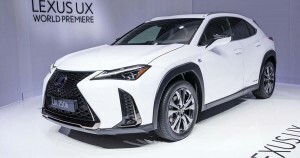 During yesterday’s media event, Lexus Malaysia announced that it would be previewing the ES and UX at the returning Kuala Lumpur International Motor Show (KLIMS) at the end of next month. The executive sedan and compact premium SUV form an important entry point into the Japanese luxury brand, so the local introductions of both models will be the ones to watch. Let’s start with the staple of the lineup, the ES. 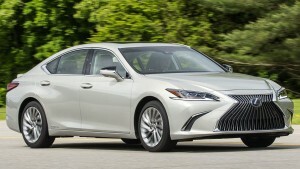 Now moving onto the modular Global Architecture – K (GA-K), essentially Lexus’ version of the Toyota New Global Architecture (TNGA) that underpins the Toyota Camry and Avalon, the ES debuts a sportier design for the traditionally frumpy four-door, helped by it being 66 mm longer, 46 mm wider but five millimetres lower – proportions that give the car a sleeker look. Inside, the ES follows the template set by the new LC coupé and LS sedan, with a sweeping dashboard design and a large centre display incorporating the latest version of the Lexus Remote Touch interface. New features include the (Japan-only) Digital Outer Mirrors with side-view cameras – a world-first – as well as the optional Lexus Safety System+ suite of driver assists and semi-autonomous driving tech. Worldwide engine choices include a 300 hp/355 Nm 3.5 litre direct-injected petrol V6 (paired to an eight-speed Direct Shift automatic gearbox) in the ES 350 and a 205 hp 2.5 litre Atkinson-cycle petrol-electric hybrid four-cylinder in the ES 300h. A 2.5 litre VVT-i petrol four-cylinder will also be available in selected markets in the ES 250, which will likely be offered in Malaysia. Moving onwards to the UX, which will take on the BMW X1 and Mercedes-Benz GLA in the ultra-competitive small premium SUV sector. This one shares the Global Architecture – Compact (GA-C) platform with the Toyota C-HR and gets a polarising exterior design hiding a typical Lexus interior. Power comes from a 2.0 litre direct-injected petrol four-cylinder, which in the UX 200 makes 168 hp and is paired to a Direct Shift CVT. The same engine is used in the UX 250h hybrid, paired to electric motors to provide a total system output of 176 hp. An optional E-Four all-wheel drive system adds another electric motor to power the rear axle. No word on the formal launch of both models, but expect them to be introduced sometime over the next year. The public will be able to view the cars at KLIMS 2018, happening from November 26 to December 2.